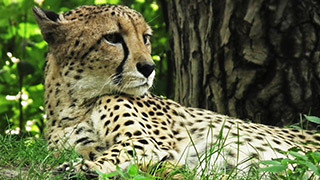 Cheetahs are big cat like hunters characterized by their slender bodies and spotted coat. They live in eastern and southern Africa and are known for being the fastest land animal. They're built for speed and can attain speeds of more than 100 km/h although only for a short while. They tend to hunt in groups, they mainly prey on antelopes and gazelles.